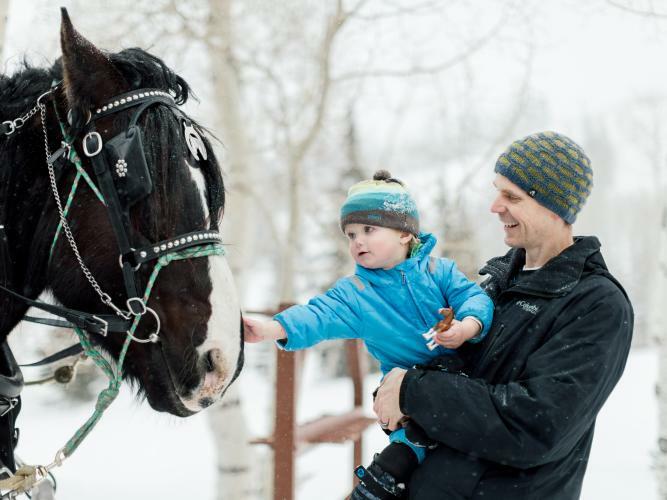 With many sleigh ride options in the Park City area, we found Boulder Mountain Ranch was an excellent family choice. We have several small kids so having a sleigh ride that was exciting and not too long was important. The sleigh rides with Boulder Mountain last about 30 minutes, a perfect amount of time with kids. When: Sleigh Rides start at 5 pm and depart every 45 minutes. I recommend going earlier so it’s warmer and lighter. Reservations are required - Go here to book. Dress: Dress WARM! Blankets are provided but the temperatures drop quickly at night. Hats, coats, and gloves are a MUST, and I recommend snow pants for kids too. We met our sleigh right behind Stein Eriksen Lodge, and it was honestly a magical setting. We’d skied at Deer Valley Resort before, but never seen it in this new way. Everything seemed frozen in time without the lifts running or skiers on the trails. In the distance, we heard the sound of jingling of the bells from the harnesses of the two beautiful horses as they came up the hill. The closer they came, the more excited everyone became. Sliding to a stop, we met our driver, and he introduced the kids to the horses. We all got some time to pet the horses and take pictures with them. With a toddler who is obsessed with horses, we all soaked up his excitement and the kids were probably equally as excited about the massive horses as they were with the sleigh ride. Our youngest kept touching the horses on the nose and showing them his toy horse, which he brought with him, creating a moment I hope never to forget. Once the excitement over the horses settled down a bit, we all loaded up into the sleigh. Blankets had been set out waiting for us, which kept us warm and dry in the falling snow. As we drove away, our driver taught the kids about the horses and told them about his life growing up on a ranch. As we rode, the kids snuggled up next to my husband and me to stay warm. The excitement of the ride was tangible, and laughter reigned as they all started to share their favorite jokes. There we were, the only ones on the hill, and all I could hear was the muted sounds of our kids&apos; laughter offset by the silence of the softly falling snow. At that moment, I had visions of a quiet and serene evening, but instead quickly became grateful that Boulder Mountain has private sleighs as the laughter quickly turned from sweet and melodic to loud and obnoxious. The kids whooped as the horses trotted down the hills, pretending like they were on a roller coaster, and next chanted their names in encouragement as they trudged up the hills. Was it a quiet, romantic, peaceful ride? No, but life with kids rarely is. As is more often the case, the energy and wonder of the kids are contagious, and we were all thoroughly enjoying the moment together, which is much more important in my book. About 25 minutes into the ride, our youngest two kids started to get chilly, and I knew that we had chosen the right ride, as temperatures drop quickly on winter evenings. As we approached the end, we slowly drifted back to reality. 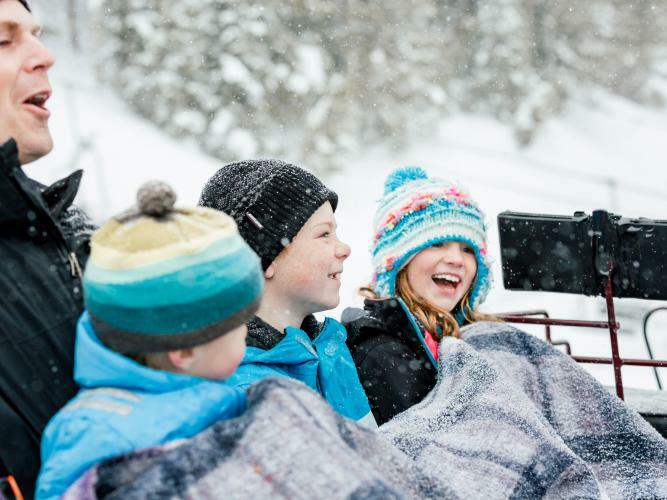 Hopping from the sleigh, our younger kids ran to the horses to regretfully tell them goodbye. The sleigh had dropped us at our chosen restaurant for the evening, and it was time to retreat indoors and out of the snow. After warming ourselves by the fire, and bribing the kids with dessert to be on their best behavior (so we could actually enjoy a nice dinner), we were seated for a delicious dinner at Cena. Cena is an excellent choice for families who want a fine dining experience that still appeals to everyone since the Italian menu caters to the whole family. Our youngest was thrilled that there was macaroni and cheese on the menu, while our older kids were drawn in by some of the pizza options off the adult menu (which was great with me because it was the same price as the kid&apos;s menu). While they were getting their fill of carbs, my husband and I devoured the most tender lamb shank either of us has ever had. The best part was that the kids enjoyed eating their food so much that they were actually QUIET...something that rarely happens when dining out with five young children! They all earned their bribed desserts, and I was shocked when other patrons stopped us as we were leaving, noting that the kids had been so well mannered. While I’d like to think that it’s due to my amazing parenting, the reality is that when the kids are so absorbed in what they’re eating, they’re bound to be still and quiet. That’s why Cena is a major win in our book! Jessica Averett is a mom to 5 kids and has a serious love for adventure and travel. She and her family lived overseas for 4 years and then took a family gap year to travel, bringing their family country count to 37 countries in the last 5 years. She and her family recently moved to Utah and are thrilled to be back living in the mountains again! You can follow her writing and family adventures on Instagram.